The cuteness is overwhelming at Time Machine Vintage’s Etsy store, which offers custom made (or if the sample fits, you can buy the sample) 1930’s through 1950’s dresses made from the seller’s collections of vintage patterns and vintage fabrics. The patterns and fabrics are adorable and whimsical, two things I love to have in a dress. From the dressmaker extraordinaire: “If you’ve ever tried to find a great vintage cotton day dress in mint condition, you know it is damned near impossible. Women wore them until they fell apart! “Make do and mend” was the buzz phrase of the WWII era and it carried over to post war too. So adding decorative appliques and trims to hide imperfections, stains, rips and holes was the norm. In my creations you’ll often find those great little vintage touches even on fabric that is in perfect condition. 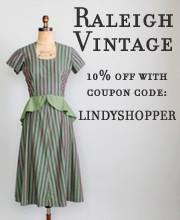 She speaks the truth – finding vintage day dresses is extremely difficult. I generally want day dresses for dancing because they are more breathable and danceable than more formal dresses and fabrics. In looking at Time Machine Vintage’s offerings, just about everything looks like it should be ready to hit the dance floor. Perhaps the best part of this Etsy store are the prices – items range between $40 and $100 for a custom dress made for your measurements, with most dresses in the $65-$90 price range. The fabric alone would cost you at least $40 if you went to a fabric store today and bought enough yardage to make one of these dresses. These dresses are a steal. Buy them quickly! 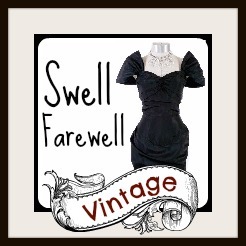 This entry was posted in Dresses, Pants, Shirts and tagged 1930's, 1940's, 1950's, dress, Etsy, pants, pattern, reproduction, romper, shirt, Time Machine Vintage, vintage. Bookmark the permalink.